Summer season is really tricky especially for infants and young children, they become ill and they might get affected by heat stroke, sunburn, and dehydration if proper measures are not taken. Don’t worry! Here are some tips to keep your child comfortable & cool during hot summer! 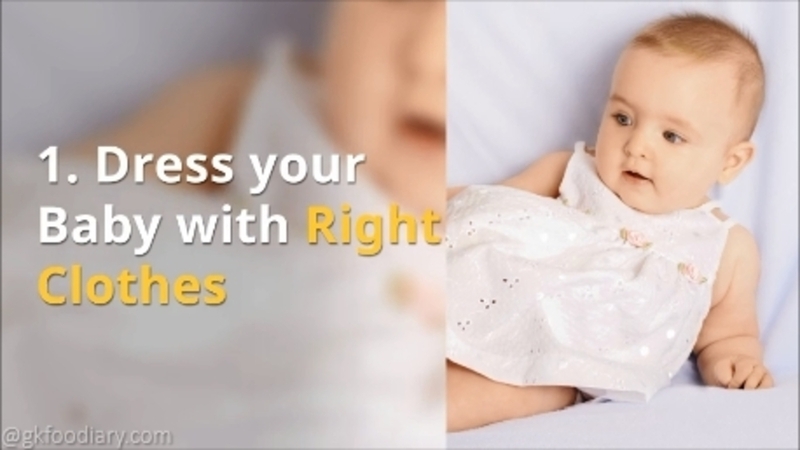 Here is the quick video for summer care tips for babies and kids to keep your child comfortable during summer. Read further below on the detailed information on summer care tips. Light cotton clothes are ideal during summer and avoid synthetic clothes which may trap the heat and may cause prickly heat rashes. Whenever possible loosen or remove the clothes. Also opt for plenty of diaper free time as much as you can and prefer cloth diapers if you can’t avoid diapers. 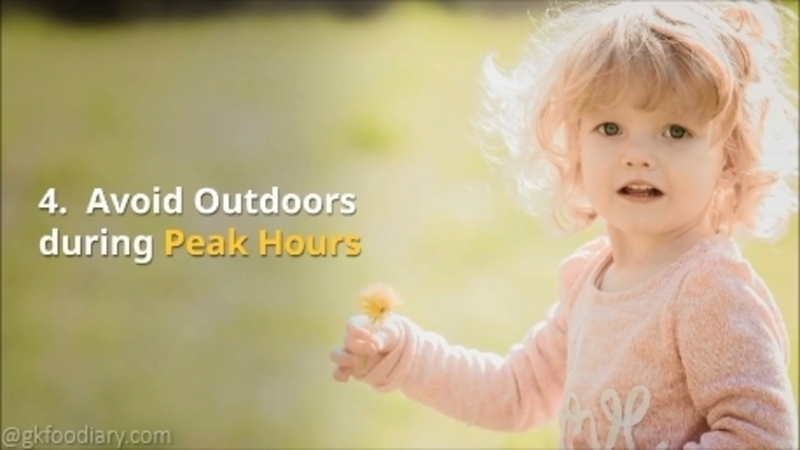 When you are going outdoors, make the baby wear long full sleeve cotton clothes to prevent from direct sun rays. Keep your baby in a airy room with good ventilation. Never keep the baby in very hot room or a parked car for a long time. During daytime, keep your child’s room cool by closing the windows with curtains and use a fan or cooler or air conditioner to circulate air in the room. 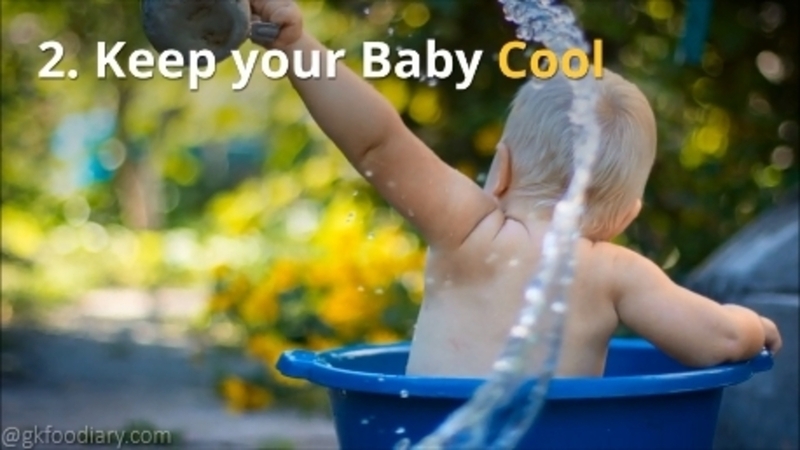 But make sure to avoid the baby from direct blast of cool air as babies might catch a cold quickly when exposed to cool air. Also, avoid talcum powders to keep the baby cool. Make your baby spend some good quality of time with water play. For babies below 6 months, do a sponge bath when the heat is more besides regular bath and a cool bath before bedtime helps to sleep sound. Babies above 6 months, can enjoy in a simple tub with bath toys or small baby pool. Don’t leave your baby alone and always watch them while they are having fun! Small infants take time to regulate their body temperature and hence take this precautions to avoid constant fluctuations in temperature(which might cause cold or fever). Keep the Fan, air cooler or air conditioner direct vent away from your baby. 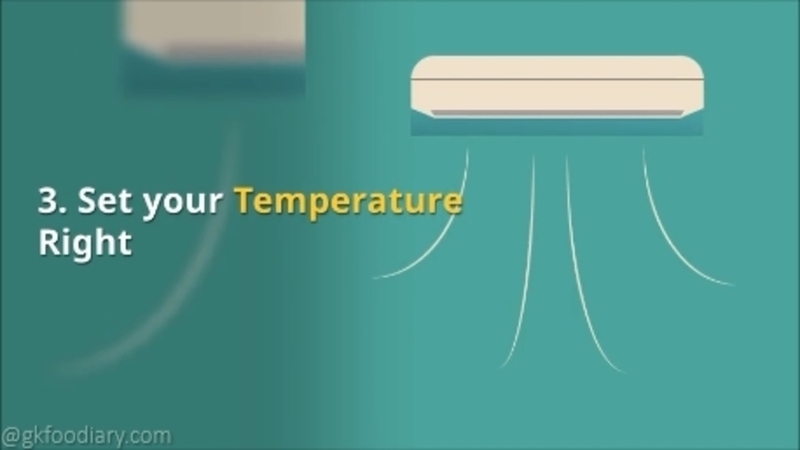 Keep the AC temperature between 24 to 26 degrees so that your baby wont get cold and adjust to outside temperature easily. Don’t take your baby to AC room immediately after the bath. Try to keep your child away from direct sunlight as much as possible and prefer staying indoors during peak hours (10 AM to 5 PM). If you can’t avoid going out, take this necessary precautions. Don’t carry the baby all the time. The less you carry the baby, the cooler the baby will be. Opt for baby friendly carriers with nylon clothes and attach a sunshade to prevent from direct sunlight. For older kids, make them wear a sun hat to protect their head and neck. When you are out, look for a place with shade, such as under tree or umbrella. For babies older than one year choose for a good sunscreen (with SPF 15 at least) and use it after consulting with your child’s pediatrician. Avoid outside foods as much as possible, even ice-creams, Popsicle etc as they might catch infection easily. Carry your own fresh food made at home or carry fruits like banana, chikku, papaya etc. Keeping the child hydrated is very important to avoid dehydration. For babies below 6 months, you don’t need to give water. Instead increase the number of breastfeed/formula feeding if you feel the baby is thirsty because of the high temperature. Babies themselves demand more feeds than usual during summer and its completely normal. 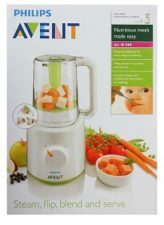 For babies who are on solids and older kids, you can give water, coconut water, fruits, fruit juices, (3/4 cup per day), milkshakes/ smoothies (not more than 400 ml per day which includes all dairy intake), chilled kheers, salads and lassis to make them cool. But do remember that any liquid shouldn’t replace breastfeed or formula during baby’s first year. Also include vegetables and fruits rich in water content and green leafy vegetables like bottle gourd, ash gourd, watermelon, muskmelon etc in their daily diet. Loss of appetite for kids is common during summer, providing them with plenty of fluids, small wholesome and easily digestible meals helps them to eat. Seek doctor’s help immediately if your child has loss of appetite with vomiting or diarrhea. 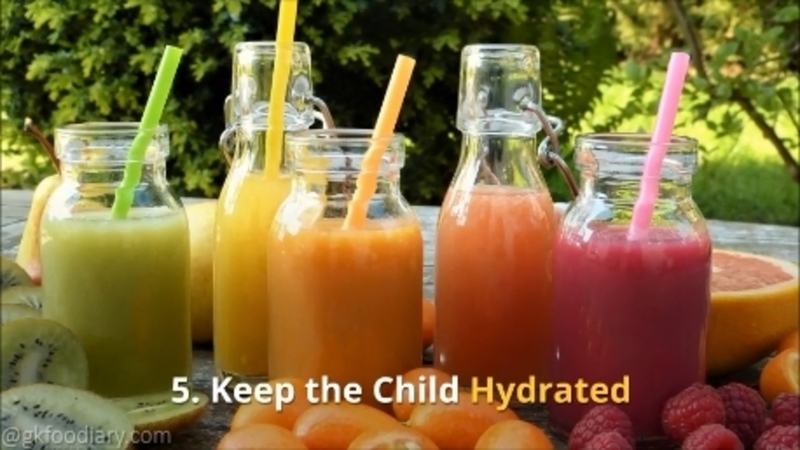 Check out the summer recipes collection for babies and kids to keep your children cool, healthy and stay hydrated. The information provided here are guidelines and doesn’t replace medical advice. Check with your doctor immediately if your baby has a poor appetite with vomiting or diarrhea, as dehydration leads to dangerous effects. Doctor may help you to determine the cause of the problem and treat it. Sugar, salt, cow’s milk and honey is not recommended until 1 years of age.